Helen Sinclair was born in South Wales in 1954. She completed a foundation course at Dyfed School of Art (1972 - 73) and studied sculpture at Wimbledon School of Art (1973 -1976) gaining her BA. 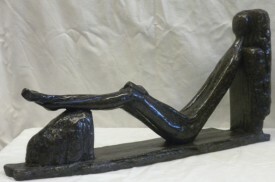 After teaching art for twelve years, she has been a full-time sculptor since 1988. She gained membership of the Royal British Society of Sculptors in 2006.I have been making sculpture for over twenty years and the process is still a delight to me. With every piece I make, I find the working process both comfortingly familiar and refreshingly surprising. Although not the only subject I work from, the human form is the one I keep coming back to: the actual figure (in movement and at rest, clothed and unclothed) and the figure as depicted by other artists in any medium and at any phase in history. I make semi-figurative sculpture, cast into either resin or bronze from originals which I make in plaster, clay, wax, cardboard, wood. The materials I work with are as stimulating to me as the subject matter. I live by the sea and collect driftwood, broken furniture, discarded plastic debris and other beach-found ‘stuff’, all of which regularly introduce new and unexpected vocabulary to explore. I have made small and large sculpture entirely of found material. These are all foundry-cast by the traditional lost wax method. 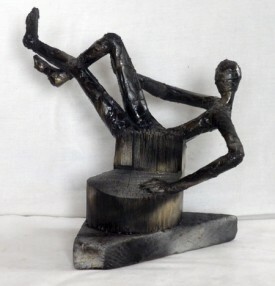 Any of my small pieces can be thought of as maquettes for larger pieces. Many of my pieces are cast in editions and sold via exhibitions. Others are commissioned - for instance by Gary Rhodes for one of his restaurants, by the Vicar of All Saints in Fulham (for the churchyard) and by Chichester Cathedral for the grounds of an historic almshouse. I exhibit widely in the UK and have work in private collections on four continents. Helen Sinclair was born in South Wales in 1954. 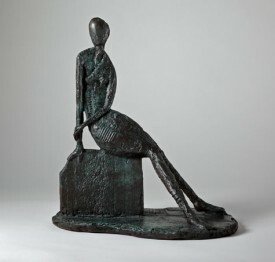 She studied sculpture at Wimbledon School of Art (1972- 1976). 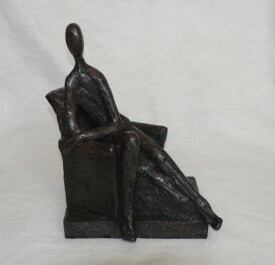 After teaching for twelve years, she has been a full-time sculptor since 1988. With her technician (traveller and writer Gary Ley) she does her own mouldmaking and resin casting. 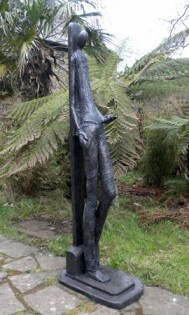 All her bronze sculpture is cast at the MB Fine Arts Foundry in Pembrokeshire. The human figure is her primary subject : the actual figure (in movement and at rest, clothed and unclothed) and the figure as depicted by other artists in any medium and at any phase in history. 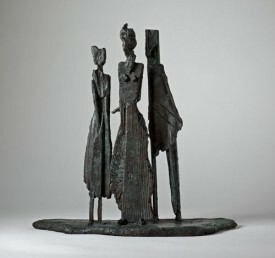 Her influences include the sculptural forms and mythology of ancient civilisations (Etruscan, Egyptian, South American), Italian Renaissance sculpture (especially Donatello) and twentieth century sculptors : Emilio Greco, Medardo Rosso, Giacometti and, most notably, Willhelm Lehmbruck. She also looks to painting for inspiration, especially Picasso, Matisse, Chagall and Modigliani. She exhibits widely in England and Wales and annually at the Chelsea Flower Show. Solo shows include: Catto Gallery, Hampstead, St David’s Hall, Cardiff; Kooywood Gallery, Cardiff, Edith Grove Gallery, London; Fairfax Gallery, Tunbridge Wells and Chelsea; The Attic Gallery Swansea.,Orleans House Gallery, Surrey; Grosvenor House Hotel, London, with Flying Colours Gallery at Dover St and Cork St Galleries, London W1, Edgar Modern Gallery, Bath. She has work in private collections in Denmark, France, Germany, Greece, Holland, Ireland, Italy, Sweden, Switzerland, Lebanon, America, Australia and New Zealand. Her customers include Lord Melvyn Bragg, Sir Robert Clark, chef Gary Rhodes, singer Bonnie Tyler, actress Sheila Hancock, actor Arnold Schwarzenegger, poet Roger McGough and Keith Chapman (creator of Bob the Builder!). 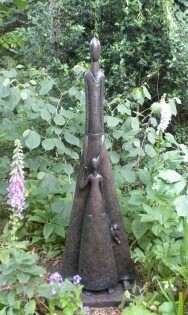 Recent commissions include ‘The Mother and the Child’ for All Saints Church, Fulham; ‘Five Figures’ for St Mary’s Hospital, Chichester and ‘Still Sitting’ for Gary Rhodes’ restaurant, ‘Rhodes 24’, Brecon Cathedral's two metre hanging bronze crucifix, 'Doo Wah Diddy' for the Royal Free Hospital in London, 'The Four Seasons' for Marie Curie's new West Midlands Hospice in Solihull, Helen Sinclair is married to sculptor Terry Ryall. They live and work in 18th century farm buildings at the end of the Gower Peninsula in South Wales.